Wednesday night was my last night working the clothing store job. Thank goodness. It wasn't a bad job, it was just a little crazy working that job and the new job along with being an awesome mom and wifey. When I walked in to start my last shift, I was surprised to find that the only person there was the company's district manager. I had never met her before, but I had been warned she can be a beast. I asked her where everyone else was, and she just said they had left earlier. Weird. Later on, she was talking to me about it being my last day and was asking about my new job and things like that ...then she broke the news. Apparently my manager was no longer working for the company. That's how she worded it. I didn't want to pry about whether she had been fired or had quit, but I sooooo wanted to know! It was killing me all night to know what happened. It's still killing me! I need to know what drama went down before I clocked in! The lady told me the news and had been asking about my new job because she wanted to know if I could come in a few nights next week to help while they're in this little lurch. Ughhhh. This has happened before -I have my last day of work at a job, and then they call me back a few more times because they are understaffed. I feel like such a pushover when I give in and come back. I hate it. I told her I'd talk to my husband and get back to her the next day. The district manager then left and told me she'd be back at closing to help out (even though I've been closing by myself for months). Once she left, so did any motivation for me to work hard that night. I mean, my manager didn't work there anymore. And who's this lady? I also had a gut feeling that this lady had fired my manager. My manager who was a single mom with a 7 month old (same as Fox) working 40+ hours a week receiving no benefits. Not cool. So I spent my evening learning a new skill (seriously, there were balloons and instructions just sitting on a table in the store. What?). I texted. I tweeted. I instagrammed. I facebooked. All of the silly verbs. All of the things I would never normally do while working -I typically like to keep things professional. And on top of that. I ended up going above and beyond our sales goals for the night. Boom! wahoo! go you!!! i can't believe crazy whatsherface fired your manager! i hope she finds another job quick! I'm glad you're done AND you picked up a handy new skill! I love that you legitimately walked out of the store and went and got FroYo haha! You go girl! Congrats on getting out of a job you hate! What a great way to end your day! Yaaaay! You don't owe them anything! Go ahead girl! And with froyo, I luh you! I've been randomly checking your blog for a while, and decided to make myself known because we have connections! 1. I know your husband! He served in my singles branch in Indiana! He's eaten brownies at my dad's house and taught my best friend some lessons! 2. You posted a link to Myke Olsen's blog in one of your recent posts. I know Myke! He's my friend from BYU-I! He also writes for Wires and Waves and so does my husband and other friends! 3. I also like fro-yo. Way to go on the whole sticking it to the (wo)man thing. And going above the sales goal while messing around. 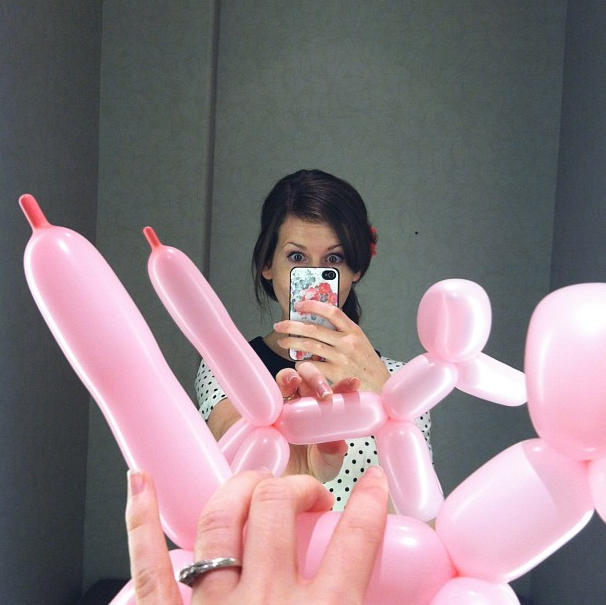 But probably the most impressive thing is that balloon dog. Maybe your next part time job could involve children's birthday parties? This picture is amazing! You and your phone case are gorgeous! And your husband is super nice--I just met him at cafe rio.